The bicycle wheel's weight and rolling resistance is a key consideration when racing. Tyres and light wheels help keep the weight down, but inner tubes are often over looked. 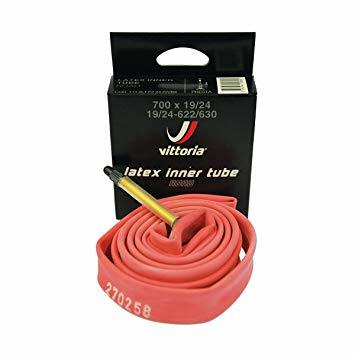 Vittoria have addressed this and produced the Vittoria Latex Inner Tube, lightweight, durable and perfect for timetrials, road races, sportives and triathlons. These ride like a cloud. Thank you for the fast shipping . Been using these for a few years on my race bike. Highly recommend. Faster and more comfy than standard butyl tubes. Have to reinflate before each ride, but worth it IMO. Simple! Best latex tubes for the best price. Excellent tubes. Much better than Michelin, in my experience. I have ridden about 1000 miles on my pair with no problems. A faster, more comfortable ride.